Still in Beta Testing. wild encounter. 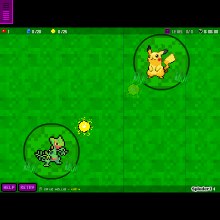 I'm working on kinks for a explanation mark above players head when running into a wild Pokemon. Keeping it hidden until you reach the point it's revealed and it's really hard to time that and still have it follow you. Hope this is fun enough. Easy and simple designs. Next will be different music samples in places like mountains, gyms, forests, battles, and other things. This will take a few games. Do not worry about the levels though. They will have little things to do but just time limits and no goals just listen and move around for a bit. Be on the lookout. I will still take people on the team. Awards are available for people who help me.